The original Generic Remote Control Keypad Repair Kit is in-stock and ships within 24 hours. The original Generic Remote Control Keypad Repair Kit carries a 60-Days Warranty. Are you having problems with individual keys? Well look no further this keypad repair kit will fix your problems. This is the perfect kit to repair your remote control's keypad, quick and easy. * Repair Solution (Conductive Paint); Enough solution to coat 15 remotes. * Full Instructions are provided. My remote has been broken for years and years. The kit gets it fixed it in one hour after only a two day wait for delivery! Beat that, anybody! by Anonymous on September 16, 2013. The product was most excellent! by Anonymous on October 14, 2013. My old remote has contact problems. This is a marvelous kit to make it work properly. by Anonymous on September 11, 2013. I use as intended an instructed as for how well it works it's to soon to say! so far so good!!! by Anonymous on March 29, 2013. The repair kit really works !! Very easy to apply and my remote was alive again. Don't waste extra money on remote repairment and don't purcahse a new one ! 90% ot the cases you can fix with this kit !! Enjoy ! by Anonymous on September 24, 2013.
by Anonymous on July 08, 2013. I CLEANED MY SONY REMOTE AND WAS ABLE TO RESTORE THE ON/OFF BUTTON. WOULD RECOMMEND TO FRIENDS AND FAMILY. GREAT PRODUCT. by Anonymous on April 04, 2013. Like Magic. I watched the video, proceeded as shown, and in less than an hour, my 35 year old remote was working like new. by Anonymous on June 06, 2013. The kit contained plenty of material to repair my 30 year old RCA remote and more besides. The kit was completely as described and arrived quickly. Being such an old remote,and no longer available to replace, there were some difficulties with disassembly and re-assembly of the item. Problem solved. I'd suggest to anyone wanting to try this kit that they make sure they can safely disassemble their product before ordering as some remotes aren't meant to be opened. by Frank on November 15, 2017. It was easy to use, but it did not fix my remote. Maybe the problem with the remote was more than keyboard-circuit board contact. by Stan on September 25, 2017. I use a URC MX-900 remote. I love the remote and the programming firmware EXCEPT that every 2 years or so the buttons would 'wear out'and the remote become useless. A new remote would cost $200- $250. With this repair kit I was able to resurrect 3 useless remotes. Wow!!!! 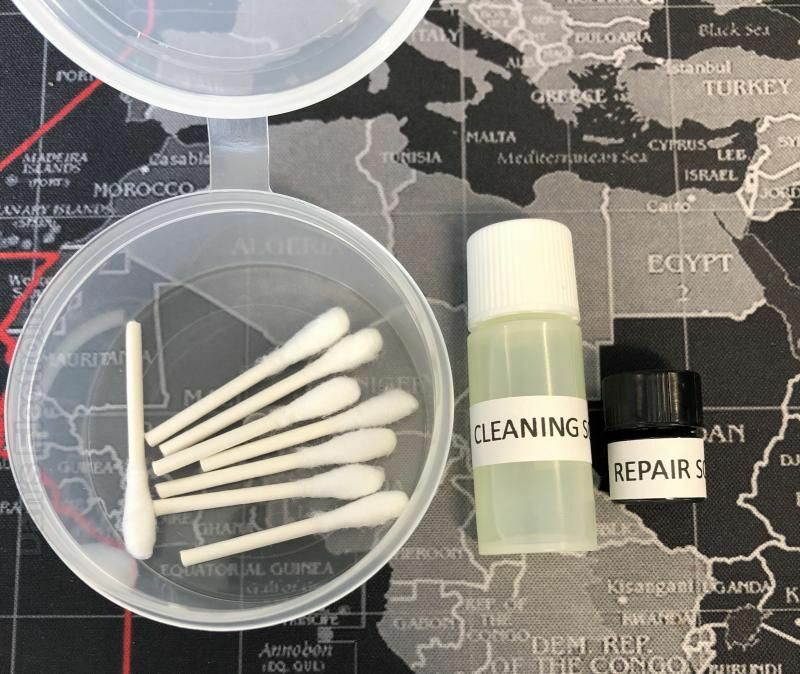 You should advertise this repair kit on all the remote replacement websites-- eBay, Amazon,etc. This stuff is a great fix and an amazing money saver. by THOMAS on February 13, 2017. An excellent product offering. Granted, it is slightly overpriced for what you receive, but this is to be expected based on the small quantities. Excellent fast shipping, well protected in a padded USPS envelope. I hope to try it this evening! by Anonymous on October 28, 2013.
by Louis on March 04, 2019.
by Desmond on February 19, 2019. Was easy to do and worked as advertised. Brought an old non working remote back from the dead, very pleased. by Robert on January 30, 2019. Product performed as expected, very fast shipping. by Carlos on January 14, 2019.
by John on June 16, 2018. Once I figured out how to open the remote it took less than 10 minutes to fix it. Works like new now. by Stephanie on February 15, 2018. The product worked real good for me. The instruction were easy to follow and the product did the job that I was looking for. by Luis on October 24, 2017. Like other people my kit didn't come with the swabs. The cleaner and the repair solution seems to have fixed the two remotes. It's only been a couple of weeks ago I cleaned and repaired them. by Gary on June 29, 2017.
by Leon A on June 13, 2017.
by Doug on June 13, 2017. Products worked great! Gave it 4 stars only because the bottles were not labeled and there were no included q-tips, even though the ad showed all of this. by Roger on May 22, 2017. Repaired a dead radio shack antenna remote thanks to this kit. All numbers were useless pushing received no response -until i cleaned and applied the solution. Now all remote functions are working. 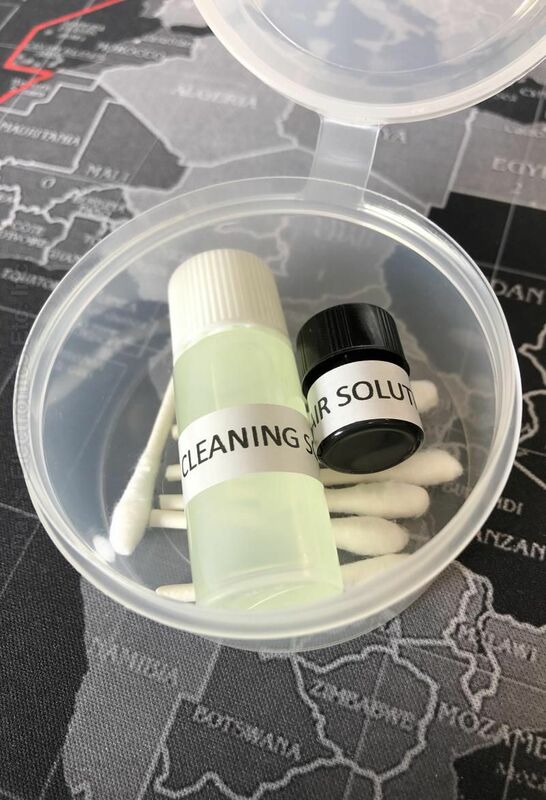 Kit is easy to use and hard to do without! by Thomas on March 13, 2017. What a great little kit. It was harder than explained in video's and instructions to open the remote, but hay ho, following the instrutions and cleaning the cuircit board and then painting the pads. i now have a remote that is as good as new again. And i don't seem to have to press as hard. Very please with the speed of delivery and outcome from using this kit. by Peter on February 23, 2017.
repair took just a few moments and is like new Good Stuff..
by kenneth on February 13, 2017.
by ramon on January 28, 2017. Worked as advertised, I have used such products when I had a TV shop and applied correctly they work well. by Brad on January 21, 2017. Excellent item, great service. Took care of my remote contact problems easily. I would recommend this product to anybody. I do wish there was more of the cleaning solution in the kit. The Q-tips soak up quite a bit when dipped in the vile. But that wouldn't prevent me from buying this product again. by Gary on October 25, 2016. Because my remote was different than the video, I had to call service tech. Followed his instructions, and remote works better than before. May have to apply the black liquid again as I was hesitant to get too much on the contact. by A Maxine on August 27, 2016. Great kit, easy and worked like magic My fan is 18 feet up and 13.5 years old. No way did I want to purchase a new remote, new transmitter and pay someone to get up there and fix it. This kit was easy, took only a few minutes plus dry time, works wonderfully. Would recommend to anyone for this price, give it a try. by Pamela on July 26, 2016.
by Harold on June 05, 2016. I used it repair a Harmony 650 remote. by Anonymous on March 02, 2016. Very pleased to do business with ReplacementRemotes. by Anonymous on November 02, 2015. Although I felt the little kit was rather "pricey" it did work just as described. I think an improvement on the "Q-tip" applicator is necessary. Not just that it is a little insulting to think one paid for (4) Q-tips....but a custom made little "sponge on a stick" applicator would not only work better (no loose fuzz spreading liquid to the surrounding area)....but it would have made me feel you cared just a little bit more. Joel Justin. www.madants.com CDBaby.com/cd/themadants ...now buy something from me. by Anonymous on October 31, 2015.
by Anonymous on February 28, 2015. Our remote control with an on/off button which worked only occasionally was cured immediately by a quick cleaning and an application of the conductive fluids included in the remote control keypad repair kit. by Anonymous on February 27, 2015. It was a quality product. My remote has additional problems. I will be sending it to you for work. by Anonymous on January 29, 2015.
by Anonymous on January 27, 2015. This is the second kit I've purchased. BOTH worked as advertised. The kit makes an old remote work like a NEW one. I HIGHLY recommend it!!! by Anonymous on November 25, 2014.
by Anonymous on September 20, 2014. Good for the home DIY person and pro repair shops. Very happy so far. by Anonymous on August 06, 2014. It's Good - I just need more COCnductive Coating!!! by Anonymous on June 14, 2014.
by Anonymous on March 28, 2014. I have used similar products before on touch pads. Anyone who is handy can use this product. by Anonymous on March 11, 2014. To repair nonworking remotes. Have recommended repair kit to family and friends. Excellent quality of product. by Anonymous on March 08, 2014.
by Anonymous on November 20, 2013.
by Anonymous on October 29, 2013.
by Anonymous on May 09, 2013.
by Anonymous on May 04, 2013. Your product (repair kit) worked as advertised. Instructions were easy to follow. I even used it to repair poor working switches on other devices. Works great. by Anonymous on March 26, 2013. If the buttons on your remote aren't registering or aren't as sensitive as they used to be, you need to get this kit. by Anonymous on March 11, 2013. I use the product to repair a bad button on a keypad, and it work. Thanks. by Anonymous on March 09, 2013.
by Paul on February 25, 2007. Easy to use. Hardest part was prising open the remote itself. No q-tips,but who cares? The cleaner and paint worked great and my 14-year old remote works like new! by Les on August 17, 2017.
by Anonymous on October 27, 2013. I would recommend the business but would advise making sure items are correct. by Anonymous on July 04, 2013.
did what was stated. well worth the money mainly because the remote I had is nonlonger made. by Anonymous on June 05, 2013. Product works well and instructions are great. by Anonymous on April 19, 2013.